“We don’t have an instrument test scheduled for today,”, the lady at the test center said, “but in that case we schedule one for 15 minutes from now.” At 10.0015 my written test began, thanks to the American can-do attitude, and I noticed there was a whole book with figures I had never seen before. About a third of the figures were new to me but luckily I noticed that the questions’ scope was still the same. I scored 97% and now I am on the last stretch toward the oral and practical exam. 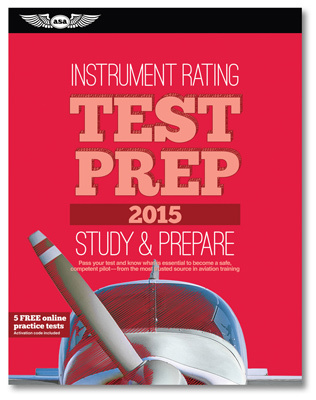 I was studying for my written with the Test Prep book for 2015. For my PPL I worked through the book during 1 1/2 months at the library. This time, while working three days a week, this method didn’t proof efficient enough. I started to use mypilottests.com and I worked through the published ~900 questions. From July through September I also went to ground school on Mondays, it cost me only $350 total and was totally worth it. I can even attend the future classes as a refresher for free. 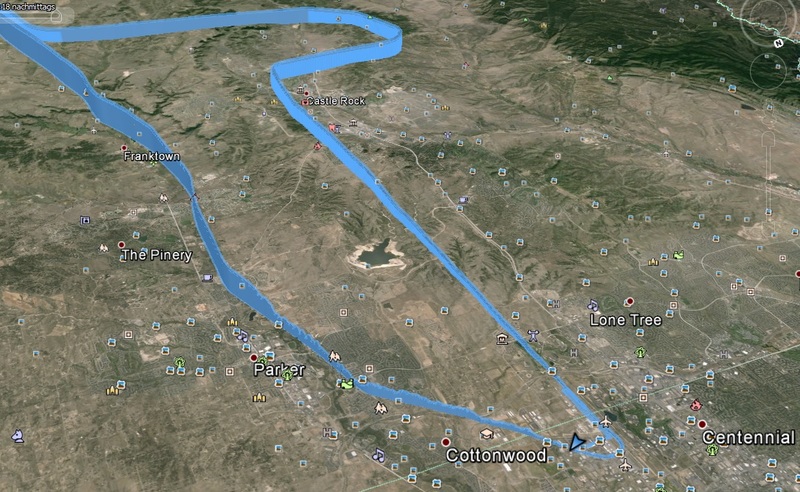 In the afternoon after the test I went for a quick flight to Front Range. My localizer and instrument landing system approaches look better with each try. I determine now headings to fly and I stopped chasing the needles. 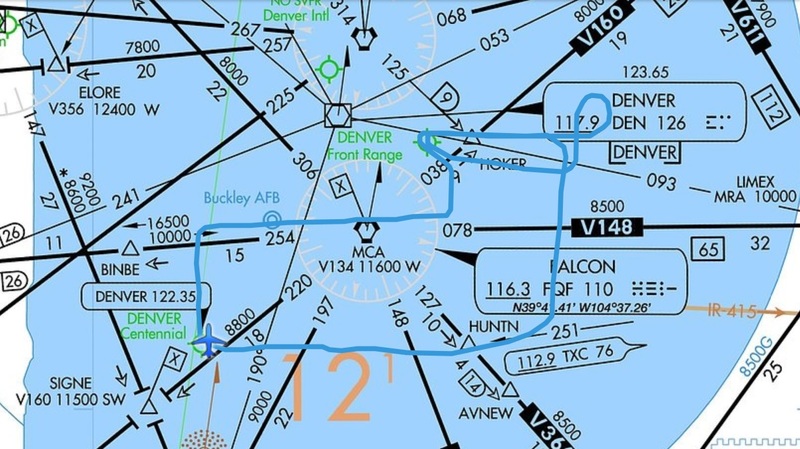 For the approach into Centennial we chose a RNAV (GPS) approach for runway 17L. On the picture you can see my flight log. 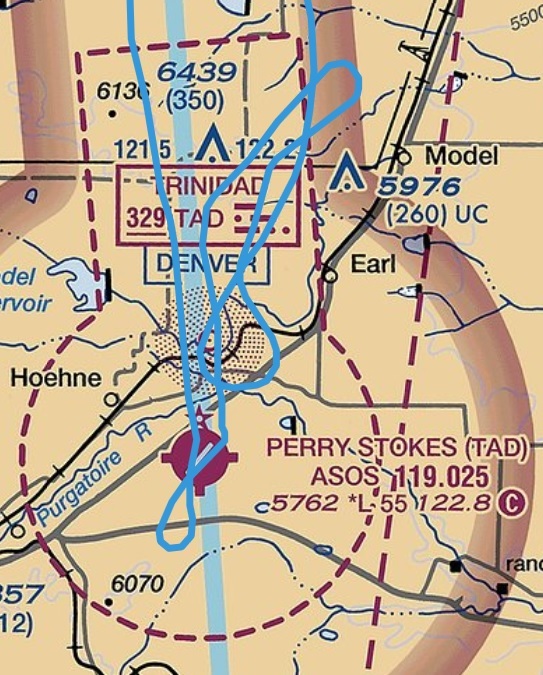 On the second approach into Front Range I was radar vectored and the controller forgot about me on the base (East of Front Range KFTG). So he apologized, and turned us back toward the localizer. It is a rule in instrument flying in that case to continue on your assigned heading and query ATC. It might even have a reason, seperation to name one. IFR training flight to Front Range. The approaches are more of a straight line, compared to the last approaches. 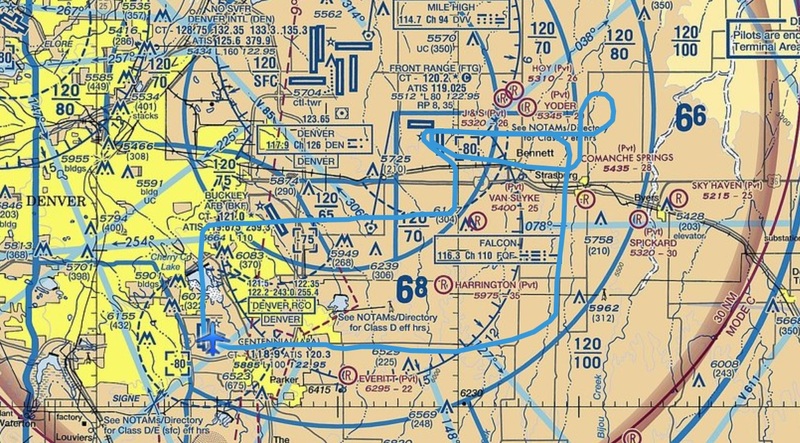 The training flight on the IFR sectional chart. Next on the schedule was another attempt for the cross-country requirement of the instrument rating. This time we went down South and found temperatures in the 13°C range (above freezing!). The flight took us to Trinidad, New Mexico. From time to time I took a look at the scenery from under the view-limiting IFR goggles. Very interesting were the mountain waves on that day. When air flows over mountains its flow becomes disturbed just like water after it travelled over a stone. If the crest of a wave rises high enough to let the air cool to its dew point, the moisture becomes visible in a distinguished shape – a standing lenticular cloud. 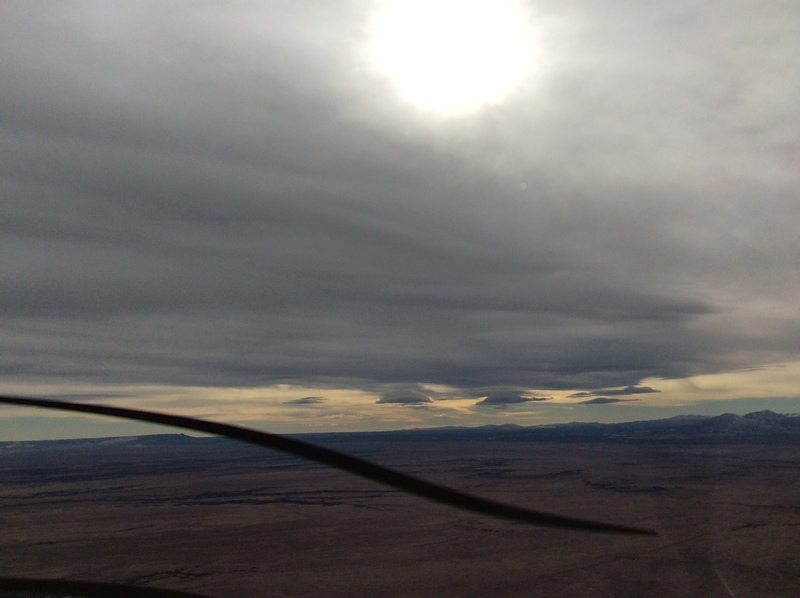 While the cloud is stationary, the airflow is fast and the cloud indicates to a pilot that mountain waves and possibly rotors below the crests are present and strong turbulence will be found. During the instrument ground school one of the instructors told us a story of him, inverted in a rotor. I figured, I won’t try this at home. The visible crests of mountain waves over Trinidad, New Mexico. NDB Approach into Perry Stokes, KTAD. The NDB approach into Perry Stokes surprised me with accuracy and inaccuracy at the same time. During the approach I had the feeling that, coming closer to the station, the ADF changed its opinion about the bearing. But I have to say that I ended up right in front of the runway and was in a position to make a steep short approach for a touch and go. The airport is located somewhere in the desert and has only GPS approaches and a NDB. I already had a GPS outage on final approach on a prior flight. Imagine this is your homebase. In IMC you couldn’t land if there wasn’t enough satellite coverage. The only option is the NDB and if you compare costs to a VOR, it might also be the only option for the airport. I like these approaches, no matter what others say. Yet, I must say that using GPS and the ADF simultaneously was confusing. 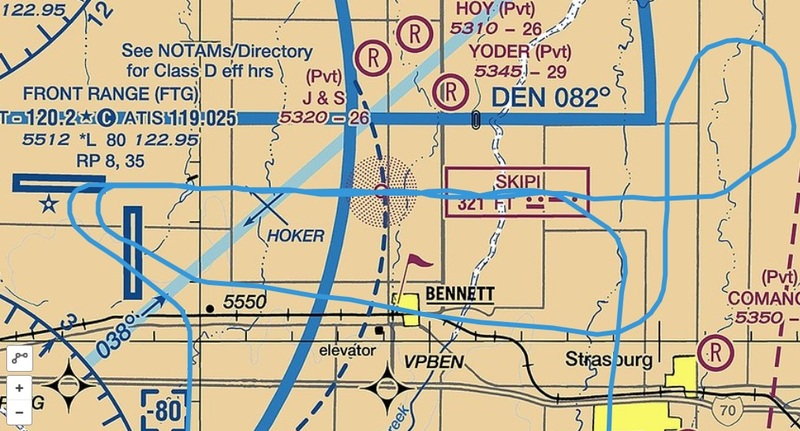 The GPS indicated my exact position on the chart – way off course – while I actually was on the correct indicated bearing on the ADF. I wished the little airplane symbol on the ForeFlight chart disappeared for a moment so it wouldn’t leave me in twilight, second guessing the ADF. Though, thinking this through, I like the situational awareness a GPS provides. 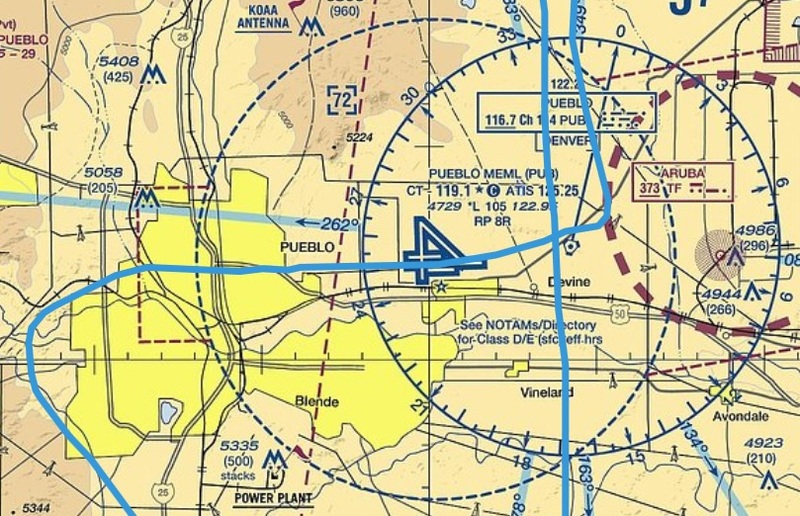 ILS approach into Pueblo, KPUB. GPS approach back into Centennial. Visualized by Google Earth. At Centennial it was the same rush as always. First we were vectored through the approach course for a jet. On the final leg the tower told another business jet behind us that there was a Cessna on the approach, doing about 100 knots and he shall prepare for a go around. No words toward me, I owned the approach, neither the jet’s pilot nor the controller seemed to care what kind of airpline hid behind this Swiss voice on the radio.